Also needs black salt and sliced for serve. 1. 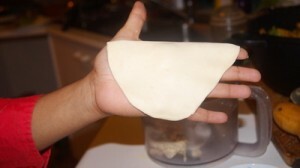 To make the dough, mix salt and water together and dissolve the salt. Then mix flour, oil and the salty water together and make smooth but a little bit hard dough. 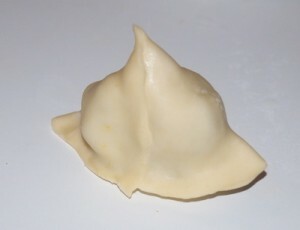 Cover the dough with cling wrap and let it set. The dough needs to sit for at least 20 minutes. 2. Heat the frying pan and pour the oil in the pan. Add the cumin seeds and when it crackles, add onion. When the onion is transparent, add one by one chillies, turmeric powder, potatoes and salt to taste. Stir them until tender. Afterwards, add the freshly chopped coriander leaves. 3. Remove the pan from the stove and let it cool. 4. 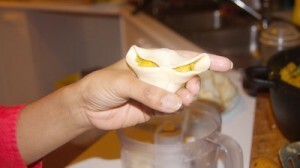 Take the dough and knead it for 1-2 minutes and divide into 6 equal balls. 5. Roll each dough into an oval shape (6.5″ long and 5″ wide) and cut each oval in half. 6. 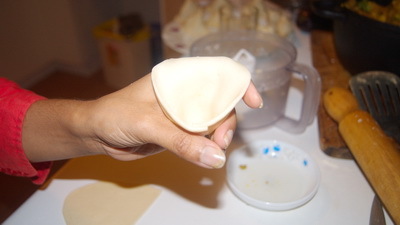 Take half of oval and make a cone and seal the edges with water. 7. 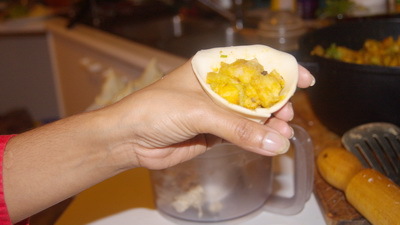 Fill the cone with the potato stuffing and seal the edge with water again. 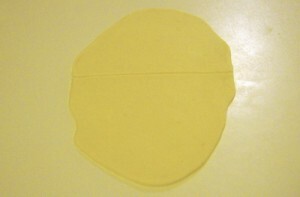 It will look like a triangle shape. 8. Repeat the process with rest. You will have 12 singaras altogether. 9. Heat the frying pan with the oil for deep fry on low medium. 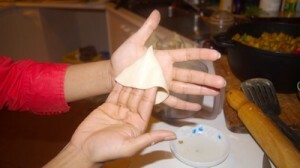 When oil is ready, place the singaras in the pan few at a time. Don’t make the pan crowded. Keep space in the pan for the singaras to float around. 10. Fry them until crispy and brown. 11. 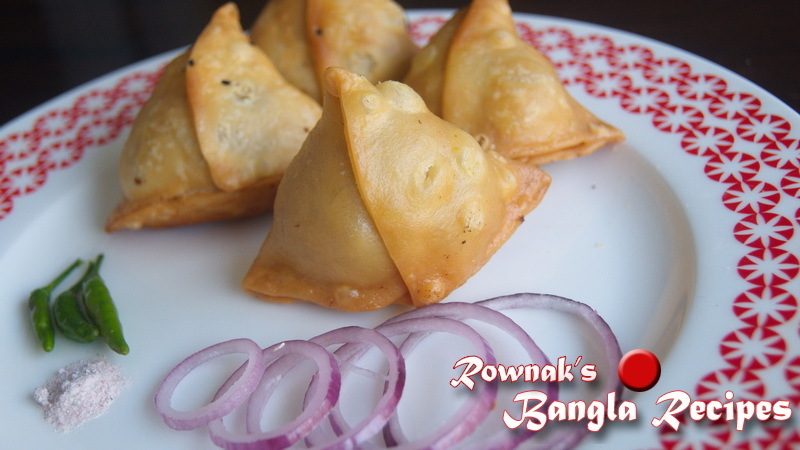 Serve Singara hot with black salt and sliced onion. Enjoy. 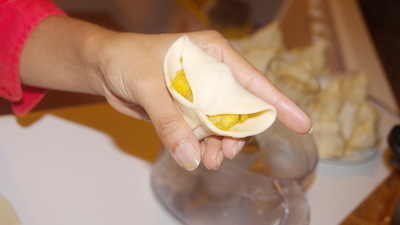 I will try to give the folding procedure of singara soon.. sorry for nt much details in this post. thanks..
apu could you tell me how can i procee singara in the fridge. The process is very easy and simple. make Singaras and place in a container over plastic or melamine plate over with plastic(keep enough room between each singara). freezer it till becomes rock hard. Remove it from freezer. 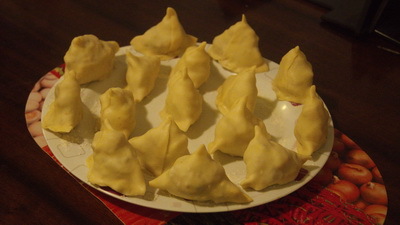 place all singaras in plastic bag and put in freezer till you want to fry it. Thanks.